CHATEAU MAYLANDIE IS ON RYANAIR'S BORDING PASS ! At the moment, Château Maylandie communicates on 60 000 Ryanair's bording pass at Carcassonne's Airport (Languedoc). 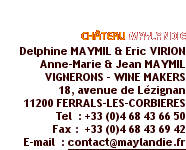 Passengers for Brussels, London, Dublin, Liverpool, Nottingham and Shannon have in this wayon their bording pass some informations about Château Maylandie.